The Archdiocese of Indianapolis has a new shepherd. On Oct. 18, Archbishop Joseph W. Tobin was appointed archbishop of Indianapolis by Pope Benedict XVI. He succeeds Archbishop Emeritus Daniel M. Buechlein, who served as the archdiocese’s spiritual leader for 19 years but was granted early retirement by the Holy Father because of health reasons last year. Archbishop Tobin, 60, was born in Detroit and is the oldest of 13 children. He professed vows as a member of the Congregation of the Most Holy Redeemer—a religious order more commonly known as the Redemptorists—in 1973 and was ordained a priest in 1978. From 1979-90, he ministered at Most Holy Redeemer Parish in Detroit, often taking part in Hispanic ministry. After a year ministering at a parish in Chicago, Archbishop Tobin was elected to a Redemptorist leadership position in that required him to move to Rome in 1991. In 1997, he was elected his order’s superior general, a position he held until 2009. In this role, Archbishop Tobin led the 5,300 Redemptorists who minister in 78 countries around the world. The following year, Pope Benedict appointed him secretary of the Congregation for Institutes of Consecrated Life and Societies of Apostolic Life. In that position, he was second in charge of the Vatican dicastery that helps oversee the life and ministry of more than 1 million religious women and men. 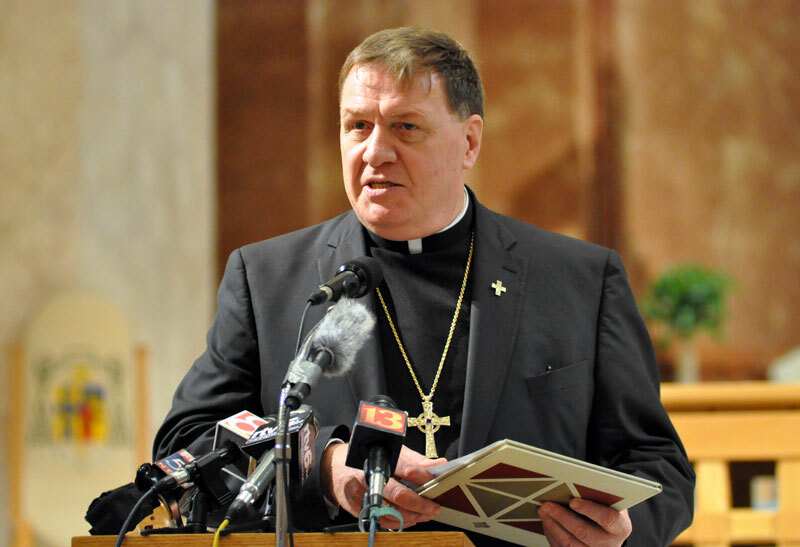 Archbishop Tobin is the sixth archbishop of Indianapolis and 12th shepherd of the Church in central and southern Indiana since the Diocese of Vincennes was established in 1834. The day before the Oct. 18 public announcement of his appointment, Archbishop Tobin talked with The Criterion about how his life and ministry have prepared him to lead the archdiocese. Q. How did you learn of your appointment to become the next archbishop of Indianapolis and what was your reaction? A. “I was surprised when I actually heard it, which was about two and a half weeks ago. “But I’ve been thinking about it a lot, obviously, since I first heard. I’ve been thinking about it a lot in the context of the Year of Faith, which began a week ago. I was there when the Holy Father celebrated the Eucharist in St. Peter’s Square on Oct. 11. “I was certainly surprised to receive this assignment. But I believe that if the surprise comes from God, then I accept it in faith. And I believe that. “I was very happy doing what I was doing. But I think that’s been true in most of the places where I’ve ever been. I’ve never been to a place where I was glad to get out of town. “I’ve always identified with those scenes at the end of the Acts of the Apostles where Paul and the people weep when they have to say goodbye to each other. Any good missionary should know that experience. Q. Although you were based in Rome for the past 21 years, you spent much of that time traveling the world. What’s it like for you, after all of that, to come to minister in a place close to your roots in Michigan? A. “That was a good experience because I realized that I couldn’t come in with a suitcase full of answers. “I’m not saying that the Church in central and southern Indiana is sick at all. Q. You joined the Redemptorist order in the early 1970s. What initially drew you to that religious community? What was it about your fellow Redemptorists, their ministry and the order’s charism that kept you there in the years that followed? A. “I think the initial drawing was growing up in a Redemptorist parish. “I also think the Redemptorists appealed to me because they gave me the notion of wanting to always go a little bit further. “We were founded by Alphonsus, who lived in Naples with 10,000 priests. But just a short way outside the town, there was nobody. So because he went to serve these people and like-minded individuals joined him, we always have in our sort of ethic the desire to go where the Church can’t go or won’t go. “So I’ve had to change my mind about Indianapolis. Even today, [I’m struck by] looking at the breakdown of the percentage of people who identify themselves as having no religion in the 39 counties. “What I would like to do is to say, ‘What are you looking for in life?’ I think you can find that in life with the Christian community. “I think I stayed because of the sort of Gospel friendship that is created among my brothers. And probably that’s the thing that I’ve missed the most in the last two years because I’ve lived for the first time outside of a community. Q. What gifts do you bring from your decades of life and ministry in the Redemptorists to your new ministry as archbishop of Indianapolis? A. “One thing that I would bring is a sort of simplicity. “We have a tradition among Redemptorists that, in some countries of the world, they call us kitchen priests. The notion there is that if you have to receive another type of priest in your parlor or in a nice room, you can invite the Redemptorists into your kitchen, not simply because we like to eat, but because we’ll help with the dishes. We’re used to a little bit of messiness and won’t feel offended. “So while I accept that my mission here is a service of leadership and government, it’s one in which my most natural tendency is to do it with some simplicity, without a need for a lot of trappings, I guess. Q. I suspect that in your ministry in leading the Redemptorists and more recently in working in the Vatican, you’ve given a good amount of attention to the promotion of vocations to the priesthood and religious life. How will that be an important part of your ministry as archbishop of Indianapolis? How do you think that you’ll approach this task? A. “The first thing that any priest should do in promoting vocations is to realize that this is not an option. This is a responsibility that we must carry out in gratitude for our own vocation. Because I’m grateful to be what I am, I think I have a responsibility to present that vocation in a real and attractive light. “Then I started to play hockey again and do other good things. “So that’s the first thing that we need to do, to show that it’s a vocation that’s worthy of a man. It’s a way to holiness. And it’s fulfilling. “I think a larger question is to make sure that the local Church understands that it’s not simply the duty of priests or religious to promote those vocations. But it’s the local Church. “I think [Pope] Benedict XVI understands this very well. I’ve noticed how it’s come up in his talks to bishops who are on their ad limina visits. “In the case of religious, he said that a Church without religious will lack certain spiritual gifts. And certainly a Church without priests is in danger of losing the greatest gift that God has given us in the Eucharist.